Book your Perfect Holiday or Ski Stay at the Lodge Now! Large, three bedroom, three bath luxury log home in Leland! Enjoy the true northern experience in our centrally located custom log home with luxurious amenities! Walk to Leland and Fishtown, the harbor, unique shops, five public beaches and many hiking and biking trails. Return home to your deck overlooking the Leelanau valley or enjoy a campfire with s'mores. 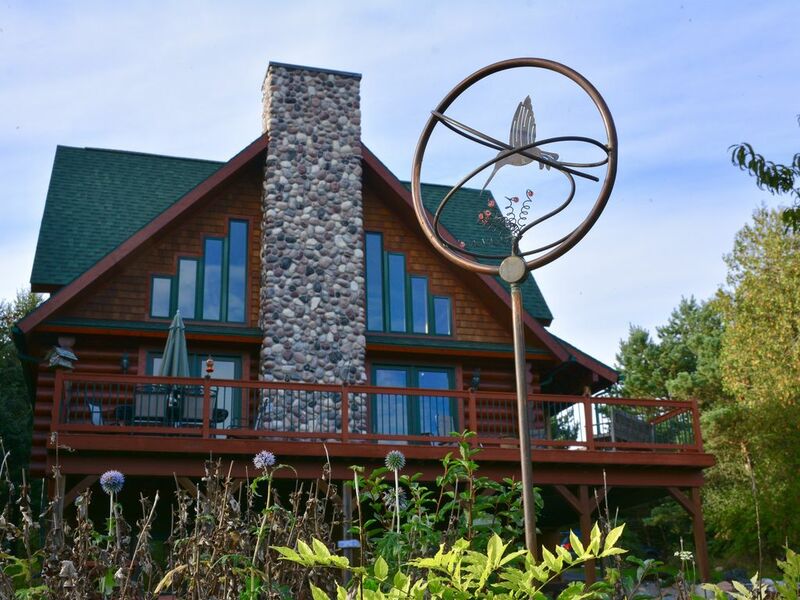 Located in the heart of the Leelanau Peninsula, Fishtown Lodge maximizes your vacation with close proximity to many wineries, craft brew houses, TART trail, Heritage trail, state parks, Sleeping Bear Dunes, etc. Bring your family and pets, our large home can accommodate everyone. All new furnishings, gourmet kitchen and quality beds provide for your every necessity and comfort away from home. There is a main floor master bedroom, huge loft, fully finished walk out with another bedroom and family room and three full bathrooms. You will love your stay at Fishtown Lodge! We are retired educators living the dream in northern Michigan. Our goal is to share our love of the lakes and nature with others. We revel in outdoor sports, the seasons - especially the Fall colors and the peaceful pace of the Leelanau Peninsula! Nothing is more "up north" than a Beaver Log Home. Attention to every detail is evident in this home. We have filled it with luxurious leathers, hides, furs and unique local art. Fishtown Lodge can easily house ten people providing a place for families to be together. The location is incredible; five blocks from Leland, beaches, Fishtown, shops, parks, and harbor. Proximity to the sights of Leelanau is a vacation home advantage! Guests can return home to a campfire and s'mores or wine on the deck overlooking the valley between Lake Michigan and Lake Leelanau. Enjoy the natural wood and authentic stone artistry of our home. Wake up to the sound of crashing waves after sleeping on luxury beds. Large main floor bath with a shower and huge soaking tub. Village of Leland within a short walk. gas fireplace with stone surround..
Driveway parking only. No road parking. No large boats or trailers. Please notify owner. YES, we have high speed internet and cell phones work great! Towels, beach towels, beach toys and beach buggy wagon for walking to the nearby beach. Beautiful and professionally decorated log room with massive stone fireplace. Luxurious leathers, furs and art. Fully outfitted gourmet kitchen with Quartz countertops, dishwasher, microwave, stove and stainless refrigerator. High quality dish ware, utensils, silverware, cappuccino maker, 12 cup coffee maker. Ping pong table, Puzzles, books and games for rainy days! Beach toys, books, puzzles, balls and toys. Landscaped front and back yards. Firepit and adirondack chairs. Two bikes for your use. Custom log home with quality furnishings. Walk to beaches, downtown Leland with shops, winery, waterside dining, harbor and historic Fishtown. Parks, hiking and biking trails nearby. Northport, Suttons Bay, Glen Arbor and the dunes all within a short drive. Fantastic stay. Great updated house with plenty of room with a short walk to the beach and town. The home was beautiful. Very clean and well appointed. It was perfect for our group with 3 bathrooms and 3 bedrooms. The beds were all comfortable. The little boys really loved the loft with bunk beds and all the cute cubbies, books and games. The location was great for us. We could walk to Leland and a close drive to Lake Leelanau, Suttons Bay and not too far to Traverse City. The deck was very nice as well as the lower level yard and fire pit. We enjoyed our stay. It is a quiet place but is still close to Leland. It was enjoyable spending evenings on the deck. It had everything we needed. The 3 full bathrooms were a nice convenience since we had 8 people. The kids had fun with the ping pong table. Thank you for your review. We hope you will consider us again for a get away! The property is lovely! Comfortable for all of us. The only issue was the loft - it got a little hot as the temps went up (it was a very hot week!). The owner thought of everything, towels, kid dishes, beach towels, bikes for our use, it was great! The Fishtown Lodge made for a perfect weekend getaway. Not only is the location incredibly convenient to restaurants, wineries, and attractions, the house is comfortably furnished. Definitely one of the best decorated places we've ever stayed at in northern Michigan! The house had great mattresses, plenty of towels, a stocked kitchen. Couldn't ask for anything more. Fishtown Lodge is located in the heart of the Leelanau Peninsula which celebrates Lake Michigan, Lake Leelanau, the outdoors, nature, beaches, wineries, craft breweries, and outdoor sports. Famous sunsets, hiking and biking trails and of course-The Dunes of Sleeping Bear!